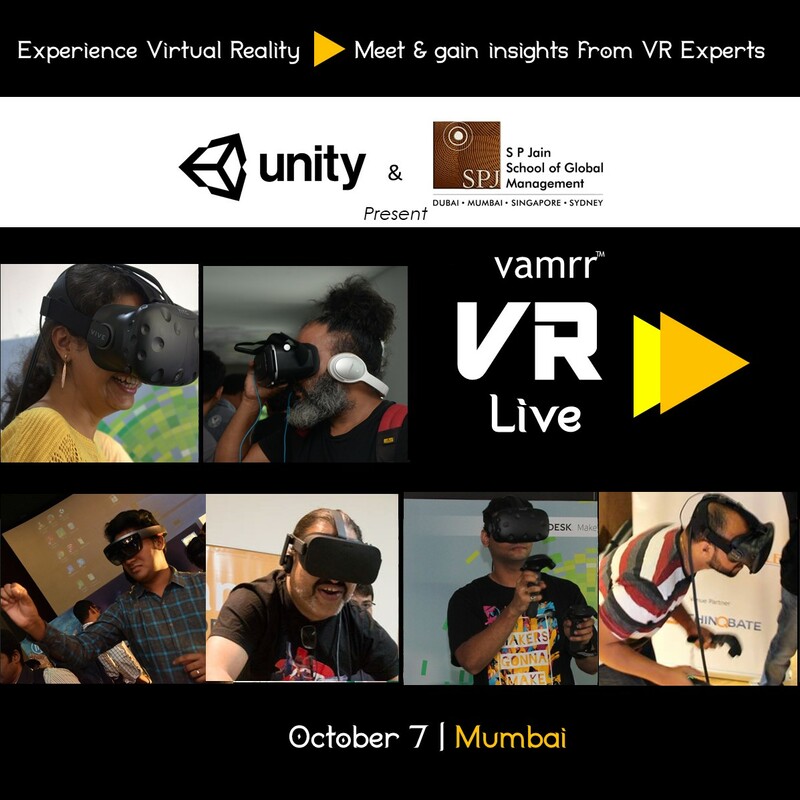 Unity & S P Jain School of Global Management present vamrr VR Live | The most happening event that brings together, the Industry’s leading experts to share insights and interact with all those who aspire to understand the Global & Indian Virtual Augmented & Mixed Reality landscape. Date: Saturday 7th October | Time: 10.30 am to 5 pm | Venue: S P Jain School of Global Management , 1st Floor, Trade Point, Kamala Mills Compound, Lower Parel, Mumbai- 400 013 | A vamrr™ Conference. The conference is free to attend. Please fill the registration form below to get a registration confirmation. Or keep scrolling to read the entire program agenda and you will find the same form at the end of the page as well. An overview of how the 400 Studio strong Indian VR & Immersive Ecosystem is faring and the scale at which it is projected to surge and grow. Notes from a Young & Accomplished Virtual Reality Entrepreneur that will give deep, first hand, comprehensive insights to those seeking to know what it is like to currently be in a team that’s pioneering, cutting edge Virtual Reality Solutions. What platforms to develop for, their challenges, what’s necessary to start building VR today and what skills are necessary to building a larger team. RAJESH SUNDARESAN | Head of 3D & VR | Tata Interactive SystemsDirect Guidance and inputs on what it takes in terms of Skills, Aptitude and Talent to be awesome in Virtual Reality. Insights on how VR, AR & MR are being effectively used in Solutions for various verticals. All this input coming from a seasoned stalwart who is part of core 3D * VR teams at one of the largest Interactive companies in India. It is compelling content that makes a medium work. And it takes deep focus, creativity and a pulse on the consumer to build compelling content. And that needs a rockstar pool of talent. 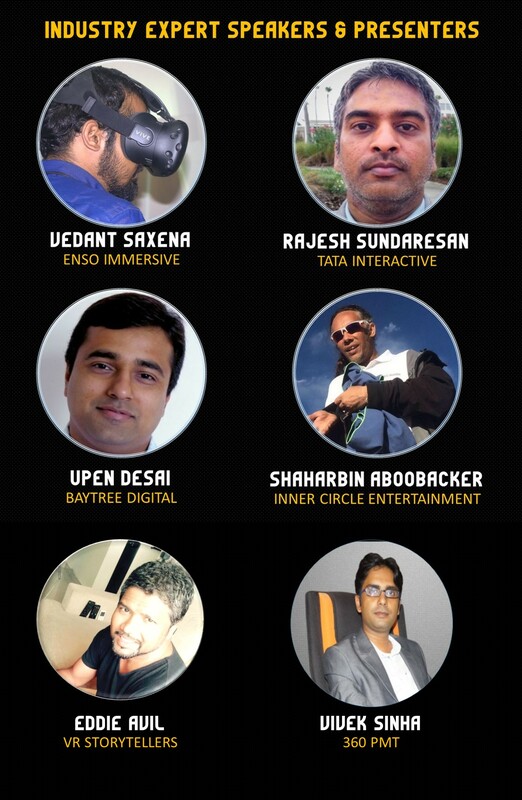 This session discusses how the VR ecosystem is creating content that will compel Indian consumers to experience VR and keep coming back for more. How the best freelancers and aspiring students can get onto very interesting projects and be a part of that awesome story. Jai & Dhananjay will be joined by the Industry Speakers in the review process. Students that impress any of the jury members may land up Internship Opportunities. Please note that this is an ideathon and not a hackathon. Participants will not be required to code or build any Demo. Their creative thinking, their ability to spot a good problem to solve through VR, their clarity of thought and presentation will be the focal point. vamrr™ will provide a certificate of attendance to all student attendees.